Why Did So Many People Not Vote For President in 2016? If you want to understand the 2016 election, Philip Kearney may have made the most telling campaign map you’ve never seen. 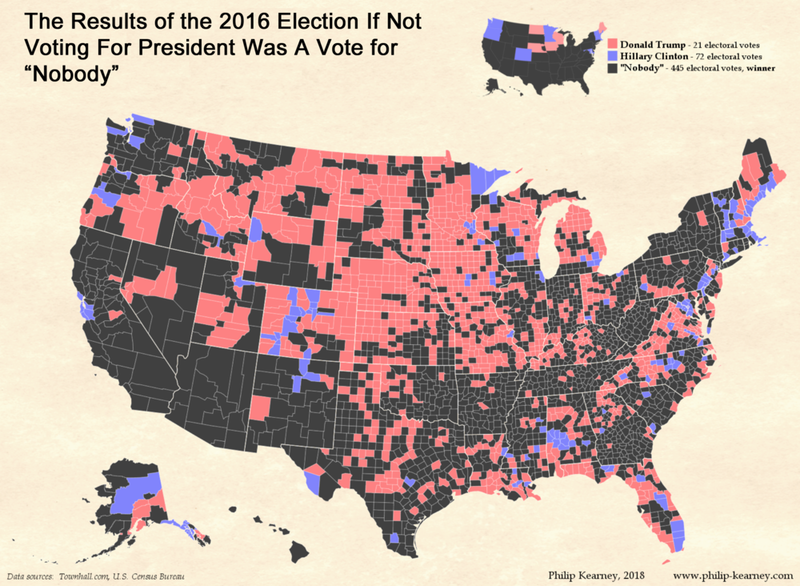 Using Census data, the map depicts who won the most votes in every county in America, if you count ‘not-voting’ as a candidate. The results are striking. Even with 138 million Americans going to the polls in 2016, 40 percent of voter age Americans did not vote. It’s a problem in nearly every state but especially bad in areas ignored in presidential elections. In 41 states, the plurality of voter-age Americans did not vote for president in 2016. How is it that our system is not reaching so many people? No answer to that question would be complete without observing that voters in 40 states are ignored in presidential elections. The winner-take-all system we use to elect our president in practice makes it so that candidates only travel to the states where the margins of victory are unpredictable. It is there that candidates pour resources and tailor issues to swing voters. It’s no surprise then that turnout on average is higher in unpredictable or “purple” states than in reliably red or blue states. But what if every vote counted equally in all 50 states? Candidates would then have a reason to seek out every eligible voter across the nation. They would direct their appeals to voters representing diverse regional interests, giving voters everywhere a reason to turn out to vote. Participation everywhere would skyrocket, and blank votes might just become a thing of the past. There’s added urgency for 2018 and 2020. We’ve noted before that Russian hackers exploited the weaknesses in our election system to manipulate voters in crucial swing-states where voting – and non-voting – determined the election. As long as voters don’t see a reason to vote, they won’t. And as long as the rules devalue most voters, candidates will have no reason to show every voter a reason to vote for them. Unless the rules change and every vote actually counts, it’s hard to see either of those things happening.